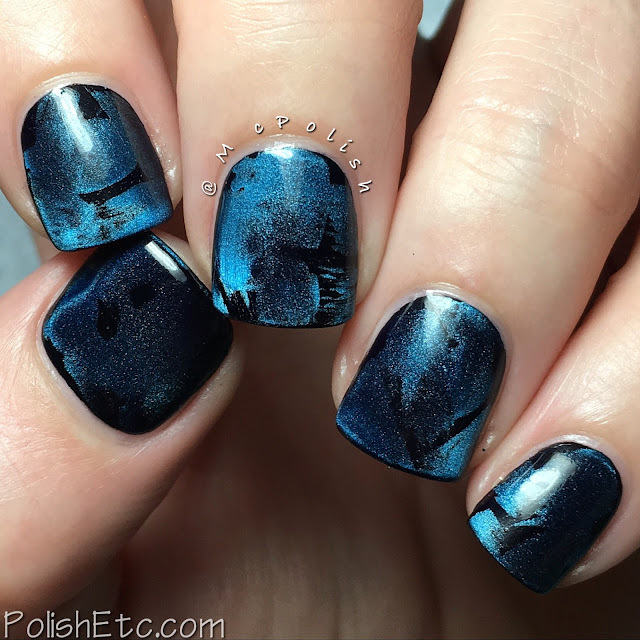 Blue Nails for the #31DC2016Weekly - Polish Etc. I have something super cool to share with you today! I have fallen back in love with magnetic polish. True story, the polish that started this crazy addiction was a Sally Hansen Magnetic polish three and a half years ago. I recently started to see Jeanette aka The Swatchaholic start doing these interesting magnetic manicures that were described as Masura Style. The key to getting this super cool affect was using a very strong neodymium magnet. Because the magnet is so strong, it can pull the magnetic particles even under a wet top coat. Oh man...it is mesmerizing. I have done a few manicures and posted them on my Instagram. I guess that Masura saw them, because they contacted me to send some of their magnetic polishes to try out. Score! This is a Russian nail polish company and we all know that Russians are pretty much magical when it comes to nail art. When they finally arrived, I knew I had to do a Masura style magnetic manicure for the challenge! Click through for some magic! For this manicure, I started with a base coat of Masura No.904-107 (Obsidian Base) which is a one coat black creme polish. Then I randomly brushed on Masura No.904/171 (Azurite Mountain) which is a midtone blue magnetic polish. Then I applied a quick dry top coat from IBD and ran the magnet over the nail. I did these nail one at a time and working quickly while the quick dry top coat was still wet. If you hold the magnet directly over the nail and hold it, it will draw all of magnetic particles to the center and leave the rest of the nail black. So I slowly moved it around to get different degrees of pull and separation of the particles. Is this cool or what??!?! Now you can do with with any magnetic polish and any neodymium magnet, but I used both the polishes and magnet provided by Masura. I just love how these came out. I still have a ton of different colors to try and a variety of techniques to perfect. I need to go watch more Russian nail magic videos! Here is one of my own. 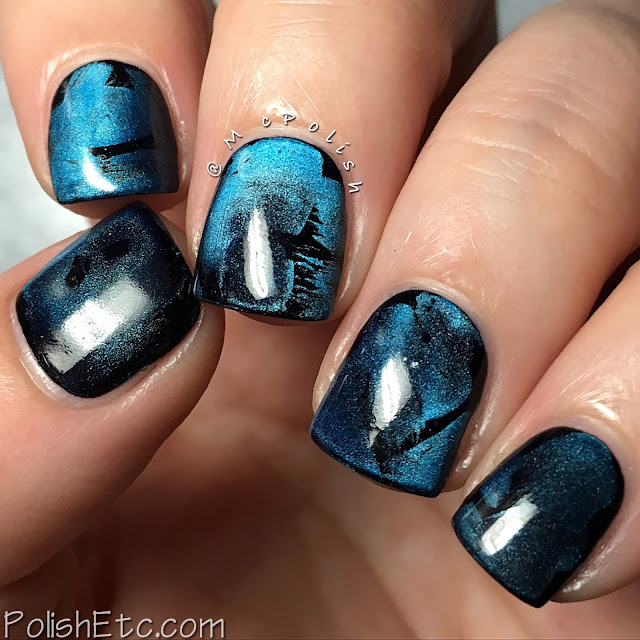 Just a little quickie to show how these polishes dance on the nail. So, so, so cool. I hope you liked this mani as much as I did! Right now, you can only purchase the Masura magnetic polishes from their site. They do ship internationally but it does take a long time. I think my package took 4-6 weeks to arrive. Be sure to check out the tag #31DC2016Weekly on Instagram, Twitter and Facebook. There are a ton of talented ladies joining on the weekly challenge! I need one of those neothingy magnets! :) (and magnetic polish... ^^) I saw the look a lot on IG and I'm intrigued. 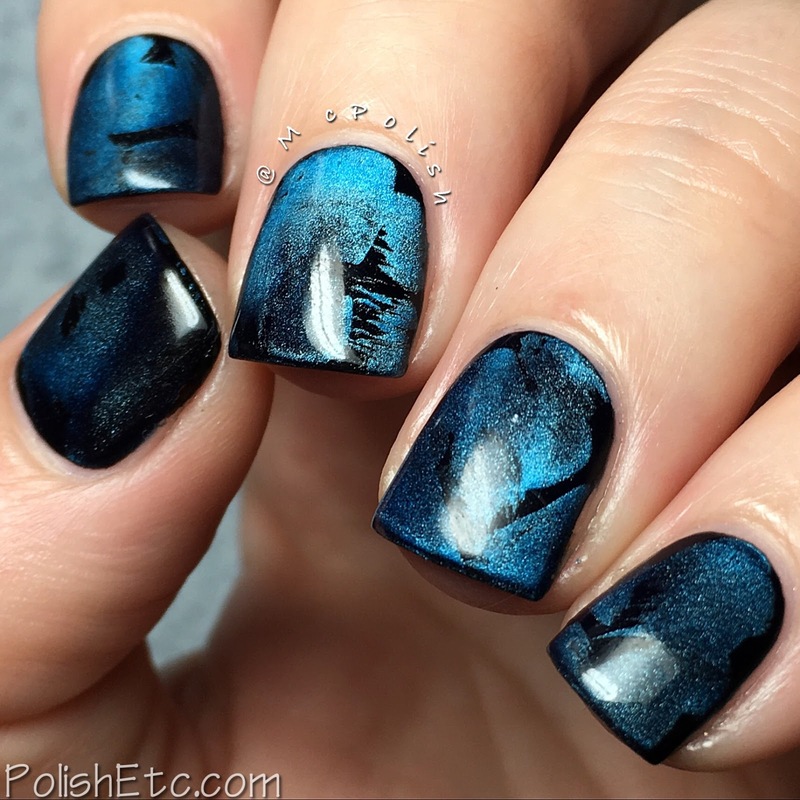 :D Love your Black and Blue nails. That is really reaallllly cool. Lucky you! *applause* I had a couple magnet polishes but never really used them. I only had a few, too. Then I got the magnet and had to get more!